Purchase required taking performance driving course. Car was fitted with limited slip differential. Purchase included a performance driving course run by John Lyon of HPC Limited (mandatory for drivers under 25 before taking delivery). Genuine HPC cars are not determined by the presence of the letter H in the 7th VIN position. Often confused with genuine HPC due to by presence of the letter H in the 7th VIN position. Some of these cars are built on the later Post 1996 "handbrake on tunnel" chassis. Caterham mismarketed some of these cars in order to shift an excess stock of HPC unique parts. Trim and equipment package to commemorate production of the 7. Lotus green/yellow paint. Genuine 35th Anniversary cars will have a dashboard plaque. Even more minimal than the GTS, the Classic was intended as low-priced entry-level model. Very minimal and lightweight and with engine suggested to be similar to that used in British Touring Car Championship. The engine is in fact just forged pistons and an uprated cylinder head with Weber Alpha Injection. Several JPEs were built as special customer orders using steel internals and rated at 280bhp, those are very rare. In popular culture, this model plays a role as Sōichi Sugano's car in the anime series éX-Driver by Kōsuke Fujishima. 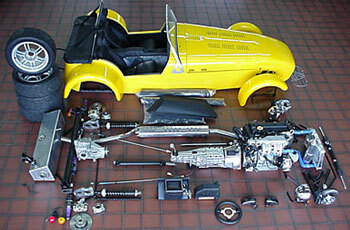 Built to commemorate the 30th year of the Caterham 7. All finished in Boston Green paint and fitted with 1.6L K-Series engine. 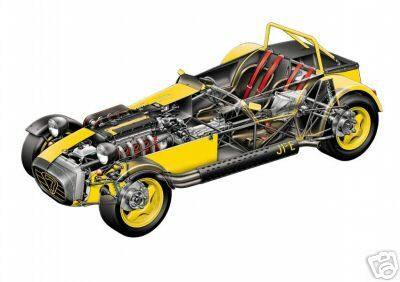 One-off built to celebrate Caterham's 50th anniversary. Fitted with Rotrex C30-94 supercharger. 213 hp - dry sumped - 0-100 in 3,8 sec S pack - Gold painted chassis, Harrods green paint, gold pinstriping, butterscotch leather seats, wood dash, ..